I received all my new equipment for my home lab a couple of days ago. After setting up the hardware in less than a day, I'm quite happy with it so far. I was lucky enough to have two 12-year-olds assist me when I assembled the computer. This was their first time assembling a computer from parts and they really enjoyed it. The first component was the Shuttle SH67H3. My friend Richard recommended the DS61, but I had two main problems with that barebones system. First, it only has two RAM slots for a maximum of 16GB. That's not bad, but I decided I wanted to get a desktop that supported more RAM without going to server components while keeping the form factor small. I actually may have a second system on my purchase list for sometime this year, and in that case I would definitely consider the DS61. Second, I had read that the SH67H3 worked as an ESXi whitebox. Overall, I am a fan of Shuttle barebones. The SH67H3 is essentially the same chassis my coworkers and I used on our lab network at a previous job, just with a new motherboard and other improvements. I used very similar or identical parts for my Shuttle as the ones listed in the ESXi whitebox link above. When we popped the case open, it all looked pretty familiar and I explained the various pieces to the 12-year-olds. 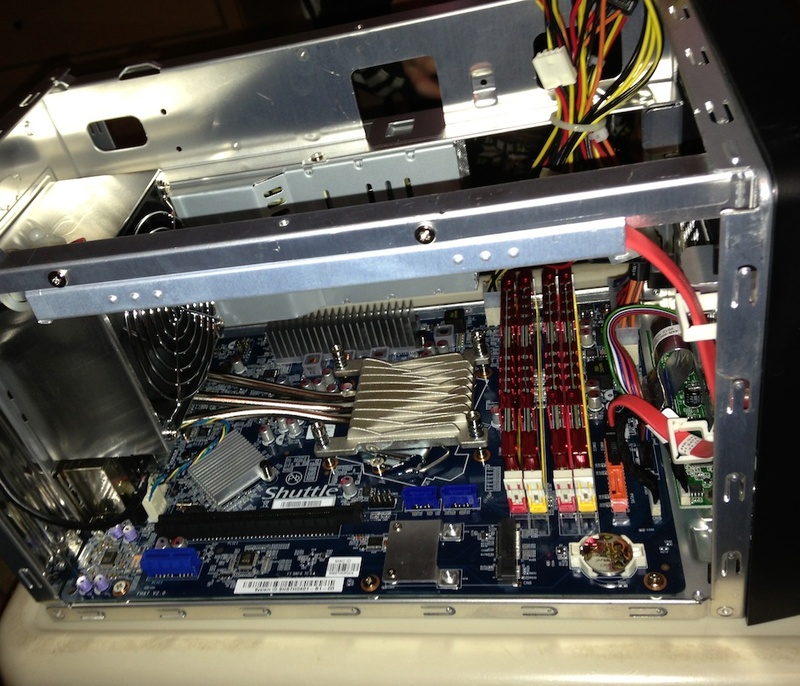 We removed the fan and heat sink array, which is a pretty nice low-noise setup. The case fan actually slides over the second heat sink so air blows over it on the way out the back of the chassis. Don't forget to remove both the sticker from the heatsink and the plastic film that is on the CPU load plate before putting the CPU in the socket. After we inserted the Intel Core i7 2600, we applied thermal paste, reattached the passive cooling, and finally reattached the fan including plugging it back into the motherboard. We also inserted the four 8GB RAM sticks. 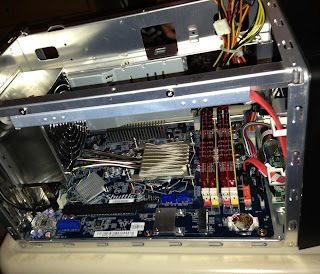 Next, we put the DVD/CD drive and hard drive into the tray, attached the tray to the chassis, and connected the SATA and power cables. 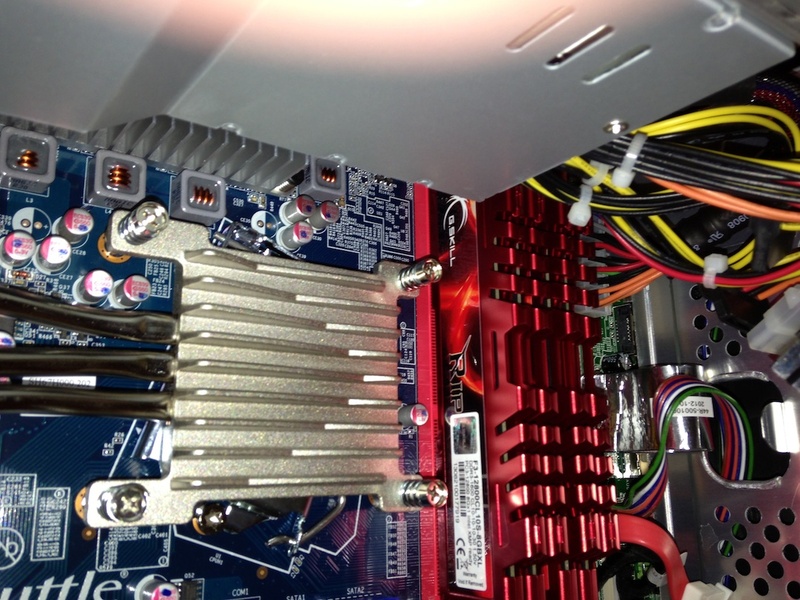 I also added a dual Intel PRO/1000 PT NIC to give a total of three physical network interfaces. We finally tested and everything appeared to be working. Going to all this trouble for a relatively powerful computer compared to my three old Pentium III servers, I decided to take the opportunity to make a couple of other network changes. I used to run my network sensor inline, but along with the new computer I purchased a Netgear GS108T-200 smart switch. This switch has an abundance of features, including VLANs and port mirroring. 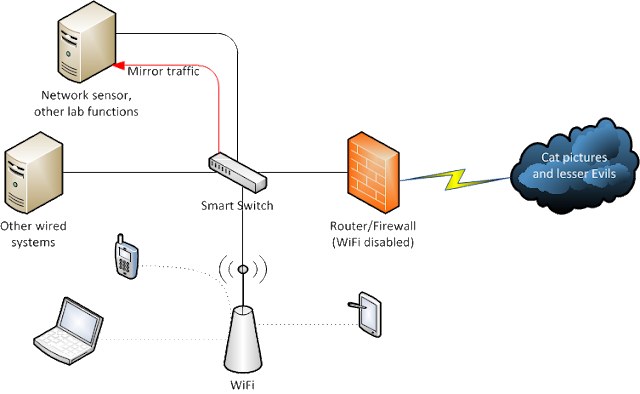 Along with the new switch, all I needed was an extra WAP to reconfigure home network as shown below. With this configuration, the switch will mirror traffic to a dedicated network interface on my network sensor. Only traffic that doesn't make it to the switch will not be seen on the mirror port. I can also configure VLANs on the switch if I want to segment the network based on functions like management interfaces and WiFi clients. I plan to write more about my lab setup as I continue to redevelop it. The first thing I did after testing the new box was install ESXi and create a network sensor VM using Security Onion. I may have a post about it soon. Did you find a way to add drivers in order to show ESXi Health Status? I have Shuttle SZ87R with ESXi 5.5.0 (custom image) and it shows Processor health and some Software components.